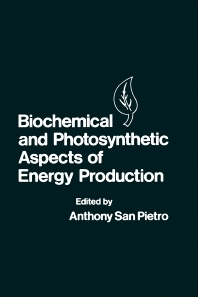 Biochemical and Photosynthetic Aspects of Energy Production describes the biological processes that may serve to provide alternative energy sources. This book contains nine chapters that specifically tackle the utilization of biological and agricultural wastes, energy farming, and leaf protein. The introductory chapters deal with the dynamics of seaweed growth, the physical properties controlling them, and the elements of algal-bacterial systems. These topics are followed by a discussion on the potential for the production of meaningful amounts of gaseous and liquid fuels, as well as selected organic chemicals from residues and biomass. The following chapters examine the fundamentals and principles of nitrogen fixation, the factors that affect the possibilities of success in energy farming projects, and the development and atmospheric consequences of oxygen and carbon dioxide cycles. The concluding chapters explore the mechanism of glycerol production in the Dunaliella alga and the energy analysis in biofuel production. Biochemists, biologists, and researchers in the fields of alternative fuels will find this book of great value. II. Why Is Efficiency Important?